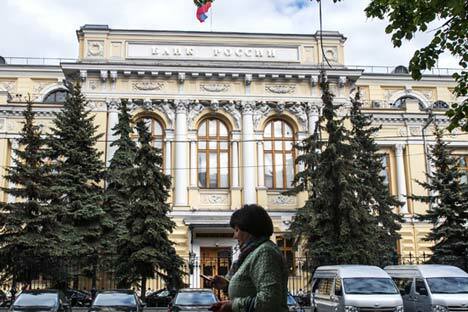 The board of directors of Russia’s Central Bank has ruled to cut the interest rate from 12.5 to 11.5 percent per annum, starting from June 16. Analysts predict that by the end of the year the interest rate will be further reduced to 10 percent. The regulator explained that given a considerable drop in consumer demand and the strengthening of the ruble in February-May, the rise in consumer prices has continued to slow. According to a Bank of Russia forecast, as a result of these factors, annual inflation in June 2016 will be under 7 percent and will reach the 4-per-cent target in 2017. The Russian Central Bank announced that it would continue to cut the interest rate as inflation continued to slow down. “This is a sensible decision given the current balance of risks. It is a good thing that the reduction was not less,” said Renaissance Capital chief economist for Russia and the CIS Oleg Kuzmin. “It means that the Central Bank will not be aggressively accumulating reserves. Had there been a smaller reduction, it could have meant that the bank intended to pursue a tougher policy driven by the need to accumulate reserves,” he said. “The Bank of Russia has sent a signal to the market that one should not expect a further drastic cut in the interest rate,” said Vladimir Tikhomirov, chief economist with the BKS financial group. This has to do with macroeconomic processes, he explains. “The rate at which inflation is reducing will slow down over the next several months. One of the reasons is weak oil prices and geopolitics. Whereas the strengthening of the ruble, which has had a considerable impact on the inflation dynamic, is over,” said Tikhomirov. According to him, annual inflation in Russia will be at 15-15.5 percent: “It will reduce the Central Bank’s ability to cut interest rates,” he said. Kuzmin and Tikhomirov expect that by the end of the year the interest rate will be 10 percent. Based on RBC Daily report.